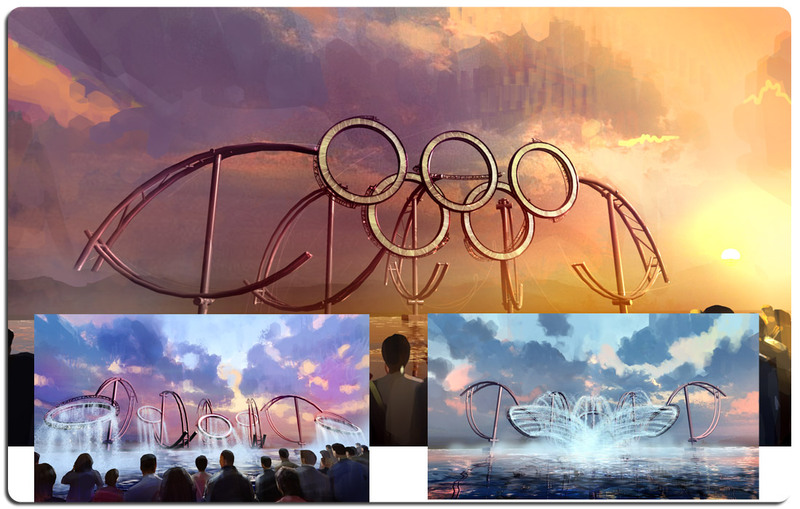 Prior to forming Modul8tion, Joe Cashman served as Conceptual Designer of this Kinetic Fountain proposal for the Beijing Olympic Games. Produced by Thinkwell Design for Beijing 2008. Art by Joe Cashman and Nathaniel West, Digital Paint enhanced CG Model. This sculpture was designed for the Beijing Olympics. As the sculpture moved, either fire or water would spew forth from the rings. A nightmare of an engineering project, it was ultimately scrapped as the cost for production was too high. This is a great example of “Blue Sky” design. There were no initial limitations during the concept phase. Joe had complete creative freedom initially, and only had to start working with the engineers once a design was approved.